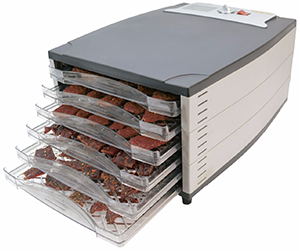 The best of both worlds, our Six-Tray Dehydrator is both compact, and powerful, featuring a hardworking 800-watt heating element that dries meat, fruits and vegetables with ease. Six large drying trays (included) provide a massive 1,022 sq. in. 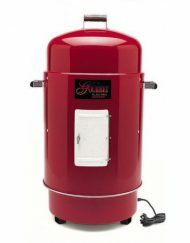 of total drying space and boast an easy-to-grab lip that makes insertion and removal both quick and convenient. Built-in dial thermostat regulates heat levels and allows you to select precise temperatures from 84°F to 160°F via an easy-to-read control panel to ensure an even, consistent final product. 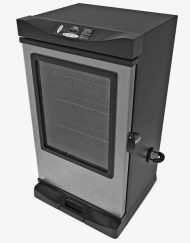 Rear-mounted fan circulates evenly heated air over drying foods, eliminating the need for tray rotation. Nonstick sheet in the bottom of dehydrator catches all of the drippings during drying and easily wipes clean to make cleanup hassle-free. One-year limited warranty.